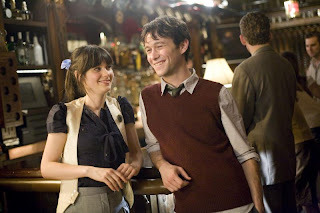 This weekend I saw "500 Days of Summer", which features the tagline "Boy meets girl. Boy falls in love. Girl doesn't." I had been looking forward to seeing this movie because I still harbor some of my elementary school crush on Joseph Gordon-Levitt -- going back to his days of shoulder-length hair when he played an alien in a human's body on "Third Rock from the Sun." Oh, the trailer also looked pretty good. Actors are harder to believe if they are always in the public eye, if you are exposed to every move they make in their private lives. And I think that idea is what made this movie so successful and what made Gordon-Levitt and Deschanel so believable as the not-totally-sure-if-we're-dating-or-in-love couple. I wouldn't be able to tell you much of anything about these actors as people, so I really felt sympathy toward Tom's unrequited love for Summer. And that feeling is part of what made me love the movie.